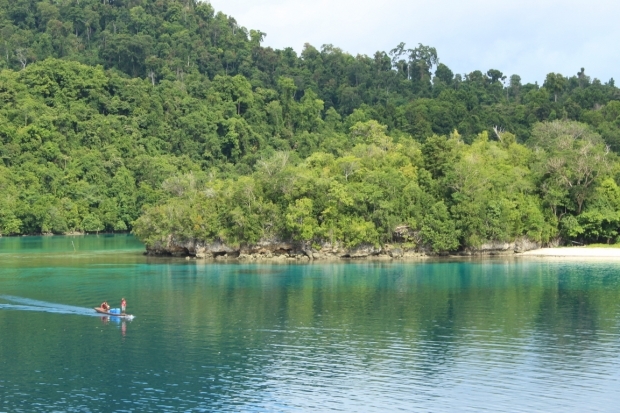 These [Togean] islands also support one of the last populations of the endangered coconut crab, a giant crab that spends most of its life on land. This crab has been wiped out throughout most of its range in Indonesia by human population. Almost 60% of the land area of the Togeans is covered in tropical forest that supports an impressive array of local and Sulawesi endemic species including: the Togean macaque–a primate only recently described; the Togean lizard; the babirusa or ‘pig deer’; and the Togean Tarsier. “They might be afraid of you, Doctor,” Lastri, the owner of Lestari Cottages in the north end of Malenge Island, said. Of course, she was joking. I had not done anything hurtful to the hornbill, macaque, and tarsier I wanted to see at the backyard of Lestari. “We usually see and hear them over there!” She pointed at the tree canopy across the bay. She must be talking about the history; I had sat on the jetty for three consecutive days but saw and heard none of them. Malenge Island is six-hour cruise by traditional motor boat from Ampana harbor town in the mainland Sulawesi, but you will not feel the trip that long. You would pass more than 30 islands, from 5 meter to 30 kilometer long. The small ones are rocky and might only have one tree grow on them; the larger ones are forested beyond the mangroves. People reside on all seven big islands and a number of smaller ones. Except in the centers of administration, these people live in stilt houses built along the shore of the islands. With a GPS and guided by the Cottages dogs, I explored the area behind the Cottages. I only saw coconut, cacao, coffee, corn, and cassava trees in the first kilometer; in the second, felled and burnt logs on the soil blocked my track; only beyond third kilometer, I walked under the trees of rainforest—it feels good. And, finally, I saw a hornbill flying over the canopies, alone. The only mammal I met was bats in one cave. We believe that unless decisive action and significant investment [millions of US dollars] are brought to bear on this problem in the next five years (2003 + 5 = 2008), the opportunity to conserve the Togeans will be lost. There was no action and investment from CI beyond meetings and surveys. I believe no donor country or individual were interested in financing the CI’s proposal, and it seemed CI did not have money or was not willing to use its internal resources to save the Togean Islands. The damage has been done, but the opportunity to conserve the Togean Islands has not been lost—the prediction of the Conversation International in 2003—because I estimate 25% of the coral reefs and 35% of rainforests and mangroves are still in prime condition. The same proportions are in restorable condition, if we can stop the fish bombing and poisoning and the uncontrolled forest clearing. This second chance will truly be lost within ten years if we let the locals continue committing ‘suicide’ under the nose of the Government. * neglected common diseases that are treatable with simple medicine and public health actions. A little amount of funding and a small but committed local team is all I need to start using that last opportunity. Albeit skeptic, I still hope a miracle will happen: people are interested in supporting my effort beyond ideas and suggestion. Out there are our admirable non-human fellows in the sea and rainforest—defenseless and voiceless—calling us to save them from being eliminated by our human fellows; we also gain benefit from the rescue: watching wildlife alive outside the screens always floods our mind with the sense of awe and wonder. No planet is as beautiful and wonderful as ours, but without them, our Earth is just a mono-species planet. What a boring place to live in!